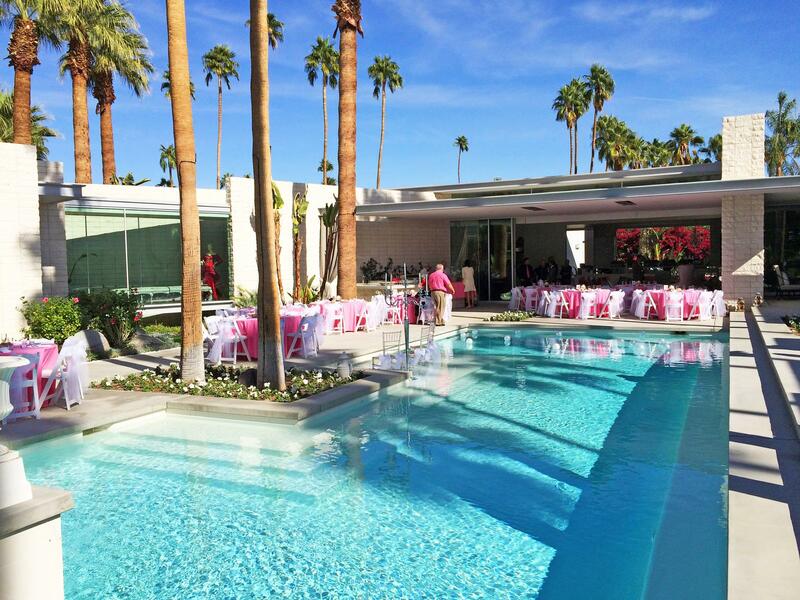 At the request of dear friends and society impresarios, Michael Bonda and Stephen Stoner, I was summoned to Palm Springs to kick-off the 2014 high season in style with a fabulous luncheon and fashion show for charity. 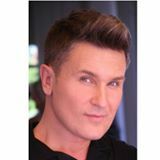 This was the Fashion Group International of Palm Springs Crystal Style Award Benefit Luncheon honoring my friend and society couturier, Fedor Rogovets and benefitting scholarships for art, design and fashion students. This stylish event was hosted in the home of Mr. & Mrs. Stanbridge, who also take residence in Vancouver, BC, and I was quite honored and privileged to be their guest. Recently completed in 2013, The Stanbridge house is an architecturally significant home in the heart of the Movie Colony. It is an exquisite example of modernist architecture that is iconic throughout Palm Springs. Situated on a double lot formerly owned by the Lucy and Desi Arnaz Family Estate, the design inside and out was completely influenced by Mr. & Mrs. Stanbridge to be a perfect haven to entertain friends and family. What makes this home unique is the monumental scale, generous use of concrete, glass, steel and slick surfaces while being altogether warm, comfortable and welcoming – which can be attributed to Mrs. Stanbridge’s eye for interior decor. The home is centered around a rectangular pool that is reflective and Zen-like as it is beautifully situated amongst the palms which frame the magnificent view of the San Jacinto Mountains. With a chic venue, an esteemed honoree and a well heeled society guest list, rest assured, this was the event to kick off the 2014/15 season! The Stanbridge Home awaiting guests! Now why is this story being captured for a cheap wine blog? Hoity toity blah blah blah…well this is really a story about serendipity. I arrived the day before and had the opportunity to chat with Mrs. Stanbridge about what she planned to serve her 80+ guest. It was a catered affair by the local purveyor of fine foods and wines, Jensen’s. Chicken, Salmon, Roasted potatoes, dainty cupcakes for dessert, open bar…well this just got more interesting. Mrs. Stanbridge, what beverages will you be serving at the bar? “Various cocktails and wine. It’s a daytime event, bloody Marys, vodka tonics, sea breezes with a lime or lemon twist, classic cocktails and my absolutely favorite white wine. You would never believe how much it costs!” This is when divine intervention hit. Ok, mind blown. Whhhhhhaaaaaat? If she had said $14.99, $12.99, $10.99, I would have been impressed. This was a wine she loves, serves and acquires for $8.99! Incroyable! The nose was classic for a Pino Grigio, stone fruit, apricot a little floral neroli. First sip is very light, not to acidic or crisp, very easy day drinking wine that finished tart but never sour. This was a wine better served chilled and not very complex as one would expect at this prince point, but it was so enjoyable, I could and did drink this all day. It was almost too easy to drink, oy vey. 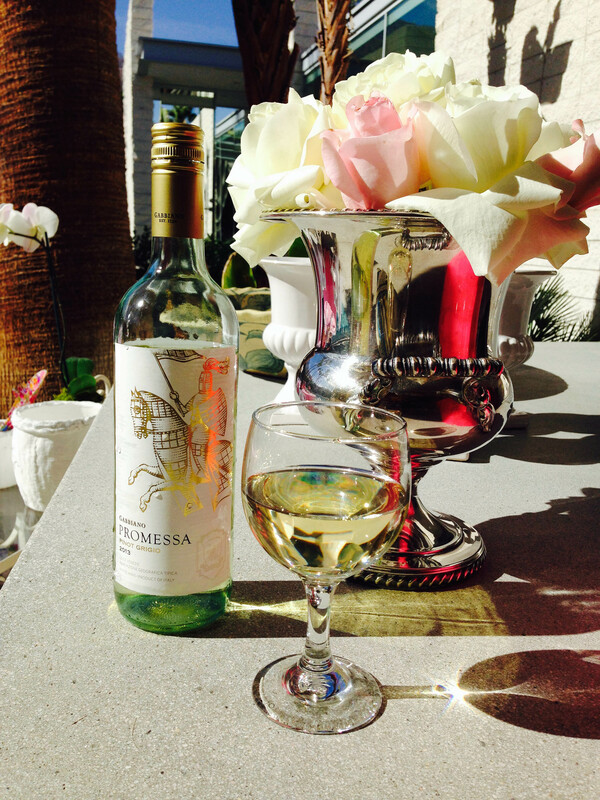 I know why this is the white wine of choice in Palm Springs, it’s refreshing, easy and spills won’t ruin the white furniture. Not only was this wine guest worthy, it was guest-proof! The crowd watching the show! The nose was soft berry, cherry some spice. First sip had a great mouth feel. Light like a typical Pinot and very balanced with pleasant tannins, dried cherry, spice, soft bark and an earthy damp moss finish. Mr. Stanbridge said he was not a big fan of fruit forward reds and loved this wine be cause it was lighter and brighter like the French wines he prefers, but of course, available at a screaming deal. As I was coming to, he suggested I try it with a few pieces of ice – I was soon on a defibrillator at the suggestion, but you know what? It was delish! Ice cubes in red wine is completely unorthodox and possibly illegal in some municipalities, but this led me to recall a cellar chat at one of the finer wineries in Sonoma regarding the chilling of red wines, especially Pinots, to the temperature by which they should be stored, 55 degrees. 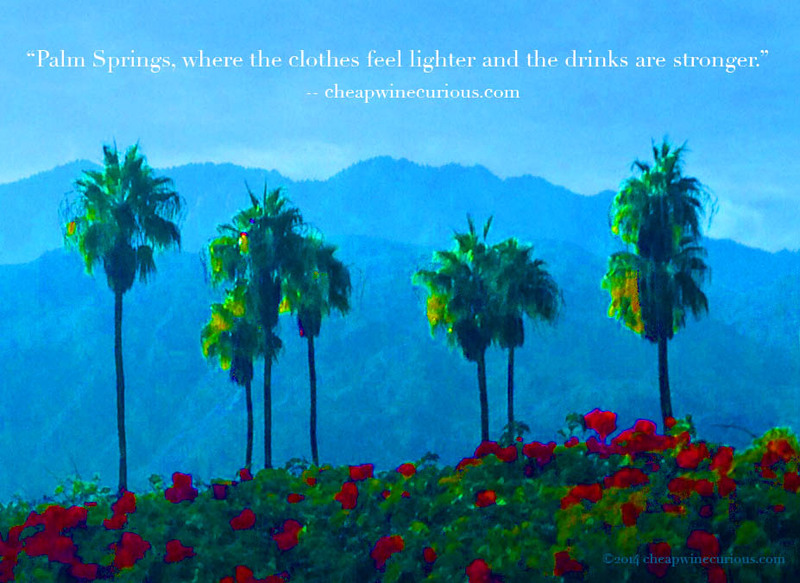 Well, we never discussed ice cubes in the cellar, but hey, what happens in Palm Springs, stays in Palm Springs. 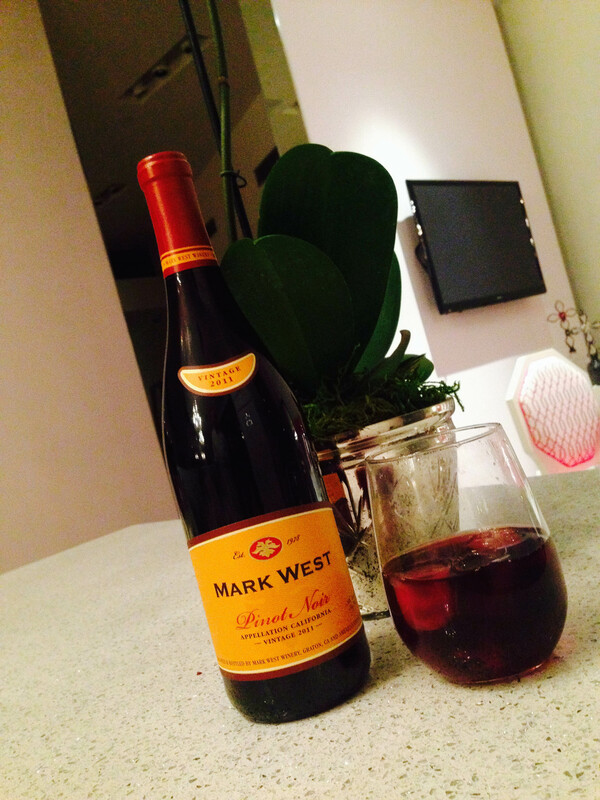 Ice in $6.99 Pinot Noir by Mark West is delicious. I rate this a buy again, ice tray not included. Well, I lived, and quite gloriously, to share this tale. I think you will be pleasantly surprised with these discoveries and happy to serve them to the throngs of guests at your next soireé. That evening, I retired to my room content with the ambition to apply a facial masque, get some beauty zzzzs and wake up ready to crack another bottle at 11am brunch on the nose. My mind abuzz, I reflected on the serendipity (#MWWC13) of my circumstances and the good fortune I wanted to share with you. ← TOP 10 UNDER $10 : #Wine Suggestions For Thanksgiving! 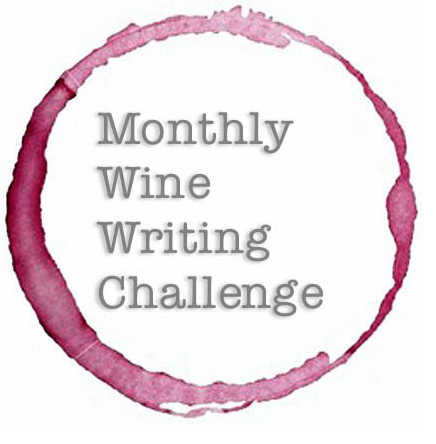 binNotes© | a wine blog. Hilarious!!! TY for sharing :). Hmmm…considering I just realized that I inadvertantly ‘double’ commented…I’ll assume it’s definately a back-handed compliment, and sign off before I get myself in trouble…again.. :).Cheers & Happy Holidays! You said it! I didn’t. I assumed you liked it so much you had to comment twice. Merci beaucoup, beaucoup!